At any point during daylight hours, an estimated 660,000 drivers in America are using their phones or other electronics while operating a vehicle. 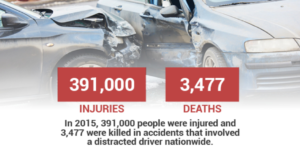 In 2015, 391,000 people were injured and 3,477 were killed in accidents that involved a distracted driver. Each one of those people put themselves in a position to possibly have to hire a criminal defense attorney to help them in criminal matters. Each state has different penalties regarding cell phone and electronic use while driving, but many are adopting distracted driving laws. For Oregon residents, distracted driving is becoming more of a punishable offense due to the state placing increased penalties on cell phone use while driving. The law took effect October 1, 2017, and corrects some definition ambiguity in an earlier bill passed in 2009, which allowed people to use cell phones for things other than texting and calling. Of course, the original bill didn’t intend for drivers to be able to play games on their phone while going 60 miles per hour down the highway, but the ambiguous wording provided a loophole for offenders. With the updated bill, drivers are no longer allowed the use of many functions of their cell phone while operating their vehicles. According to the Oregon Department of Transportation, drivers can start or end functions on their phones if it is limited to a single touch or swipe and is hands-free. Meaning if your cell phone is dash mounted, you can take calls, but if you have to physically pick up your phone, then you’ll have to let it ring. The law applies to all electronics including laptops, GPS, tablets, and any other device not permanently mounted in your vehicle. The bill allows drivers to dial emergency services only if there is no one else in the car able to do so. With the new restrictions on electronic use and distracted driving, drivers will have to be more cautious than ever when operating their vehicles. If you get into an accident in which someone was injured or killed, and they have reason to suspect you were distracted in any way, you could face serious charges and should contact a criminal defense attorney right away. Accidents without injury have a three-tier system with up to a $2,500 fine and six months jail time for the third conviction.